stinamoo wrote: Any chance of getting the parents to pay for the kid's dresses? Just giving them a colour scheme/style? My future mother in law has said this morning that because we are not having top-hat and tails she will pay for the bridesmaid dresses, i think this only goes for the kids dresses but thats still awesome coz it was them that i was worried about! Amy, no matter what anyone says - stick to your guns, coz once you have one bridesmaid it bloody escalates and it never stops! some friends I've known since school always went on about it, but now I'm actually getting married, no-ones said anything about it! I know what you feel about having like 12 bridesmaids! http://www.cherrybombdreads.webs.com High Quality Roving and Synthetic Dreads! cherrybombdreads wrote: I know what you feel about having like 12 bridesmaids! Thats pretty much what i said to my friends!! i have 7 bridesmaids, told them the colours i wanted them to wear and said go find a dress that you wanna wear!! so much easier! "never be afraid to reach for the sky, for if you fall, you'll land among the stars"
I keep being told that I need to have Paul's cousin (all 6 girls! ), my sisters (2 of them), my cousins (6 of them). I told everyone that it'll be mine and Paul's day - not anyone elses! I'm offically getting excited now! It's all sort of coming together, going to look at another reception venue tomorrow. Will most likely be a TA centre but it's hugeeee apparently. I so want to become a wedding planner haha! oooh wow, what a pretty ring!!! I shall warn you now though - dont get over excited and ask the whole world and their sister to be your bridesmaids! Thanks! How many bridesmaids do you have..? On the plus side though his mam is going to pay for the dresses so its not all bad! Just be very careful, its a slippery slope! miss_mortisha wrote: Thats pretty much what i said to my friends!! i have 7 bridesmaids, told them the colours i wanted them to wear and said go find a dress that you wanna wear!! so much easier! Really?! Awesome. Are you guys having secret bridesmaid meetings with out me?!! First I knew about being a bridesmaid was when you told me you'd chosen a colourscheme! Keep me in the loop chicky! Congratulations to all of you engaged ladies. All of the Wedding photos are gorgeous too. 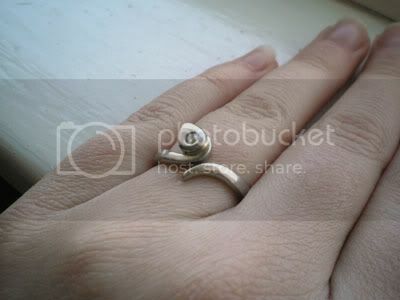 Myself and my boyfriend just got engaged..... and I'm already planning the wedding even though it isn't until 2013. 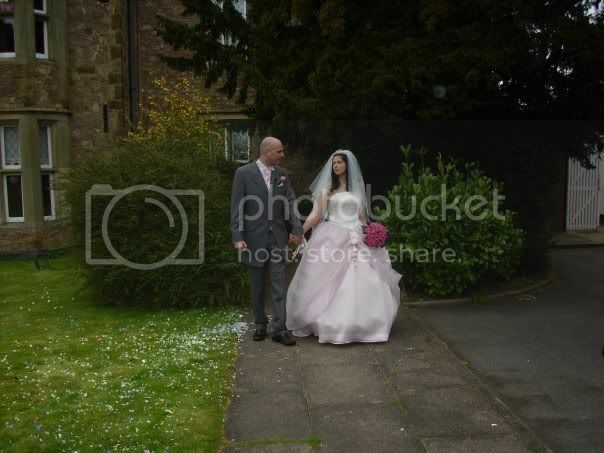 Originally me and the fella were planning a small registry do at the local town hall with just a few witnessess and then a piss up in my usual pub, but i've since found out due to a long lost relative i'm coming in to some unexpected money so i figured i never intend to get married again so i may as well go the whole hog with it. So its a posh place and i'm even having a big wedding dress. My problem now is how to do my hair. the colour scheme is cream olive and chocolate brown. i know a full head off kk dreads will annoy me all day so i'm planning on thin cream roving dreads with the olive green and chocolate brown accents, but i want a proper updo with them not just tied back out of my face. Any ideas? I know the problem with having so many people you want to add as bridesmaids, so far i have y best friend and the fellas two little sisters. but then theres my half sister and 4 other really good friends i want to have as well i just dont want to over do it though. so far the fellas best friend will be best man my son and my best friends boy will be page boys but then theres the fellas two brothers (and who ever else his mum is fostering at the time). hmmmm not good, i dont want to leave people out but then i dont want to have more stress and the more people = the more stress *shrugs*. At least i have 2 years to get it all sorted. (i know it seems early to be thinking about it all but if i can get most of the planning done and out of the way its less to worry about as it gets closer). I'm also thinking of having a candy buffet. A place nearby does topiary trees made out of sweets.... i already have a chocolate fountain... Problem is i cant decide if its too tacky or not for the place we want to have it in (A huge 17th century hall that until about 20 years ago was owned by the Queen). I love the idea of it but things could get very sticky very fast, especially with my son anywhere near it. Funny this thread is around again because...I'M GETTING MARRIED TOMORROW!!!!!! Loric, just have as many bridesmaids as you want and get dresses that are slightly cheaper. I got really lucky, i found 3 of my 4 adults dresses in our local paper. Brand new and never worn. They only cost £90 each. I then got the same colour but slghtly different style for my sisters(maid of honour). On that note....I've been married 9 years in January. Congratulations to all those recently married and engaged. I got married 3 years ago. We had the traditional wedding at church (that was my hubbys request, Im not at all into that, but as I had everything else my way I let him have that one). I did as much as I could myself gto reduce costs (I made all the invites, table decorations, favours and got my dress 1/2 price in a sale) and I shopped around like a maniac finding the lowest prices. Im glad I did, as we had an amazing day. Although over in a flash. I had my hair natural coloured on the day, with a mass of great lengths pre-bonded extensions in. Here is one of my fav piccies. I don't really like photos of myself, but these ones I quite like. 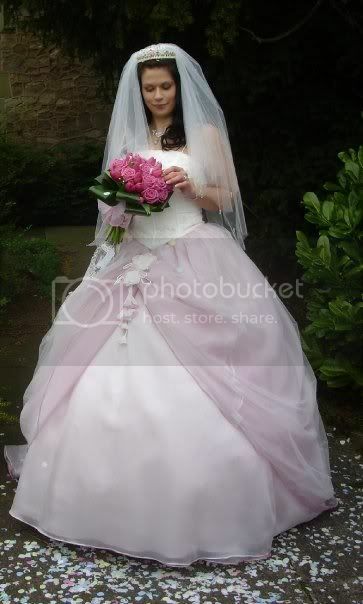 Although looking back at the wedding now, the dress was slightly "gypsy wedding" as it was quite big. Loved it though. Whoo, this is an awesome thread! I've been planning stuff out recently so this is exciting to read!